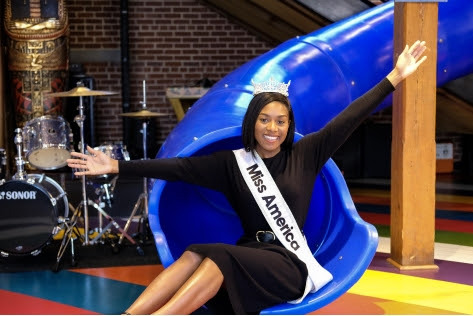 Nia Franklin Miss America 2019 visited with students at the Ron Clark Academy as a judge in The Amazing Shake National Competition on Thursday. The Amazing Shake is a competition that places an emphasis on teaching students manners, discipline, respect, and professional conduct. Prior to the competition, students learn the nuances of professional human interaction as they are taught skills such as how to give a proper handshake, how to “work a room,” how to give a successful interview, and how to remain composed under pressure. On Thursday, those skills were put to the test. With about 37 stations in place, students were faced with a variety of scenarios to test their skills from a conversation with Miss America to a mock White House Press Conference. Franklin served as a volunteer judge alongside more than 60 professionals and leaders from the Atlanta community. Co-founders Ron Clark and Kim Bearden were also in attendance. Visiting with students across the country is just one part of Franklin’s job. As an arts education advocate, Franklin has worked with the likes of Lincoln Center, ASCAP, and Julliard to bring attention to the need for more arts education in schools. In addition, Franklin is the national ambassador for Children’s Miracle Network Hospitals and serves as a partner for Sing for Hope, an international organization.